Team at Came Down: Jack Bircham (Woburn), Adam Clayton (Donnington Valley), John Cronly (Frilford Heath), Brian Davies (Newbury & Crookham), Laurence Eltham (Goring & Streatley), Matthew Haddy (Bicester), Scott Hunt (The Oxfordshire), Richard Lee (Goring & Streatley), Adam Smith (Buckingham), Ashley Walton (Frilford Heath). The County Team enjoyed a fine win over a strong club side on 9th May at Stoke Park. Trailing after the morning foursomes by 2 points, the match finished 8-7 in favour of the County Team after they won the last five singles games. 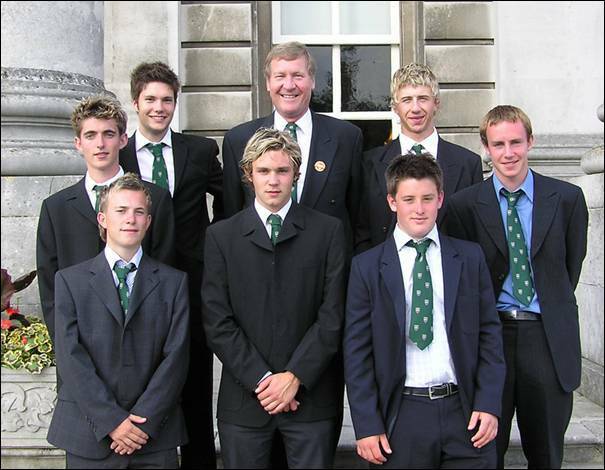 Team at Stoke Park: David Addison (Donnington Grove), Matt Briggs (Donnington Grove), Craig Buttivant (Gerrards Cross), Robert Christian (Beaconsfield), Ben Harwood (Hazlemere), Adam Hinkins (Chiltern Forest), Will Roebuck (Mentmore), Chris Tellett (Woburn), Ashley Walton (Frilford Heath), Lee Wanklyn (Sand Martins), Adam Wootton (Oxford City). We had a great result in our first League match against a determined Middlesex side at East Berkshire on 23rd May. In an intriguing match the morning foursomes went to and fro with the lead in all the games going one way – then the other. David Addison (Donnington Grove) and club mate Matthew Briggs opened the scoring for BB&O. County Captain Craig Buttivant (Gerrards Cross) partnered Clive Bowler (Oxford City) to a comfortable win to level the scores 2-2, after we had lost the opening games. Team at East Berkshire: David Addison (Donnington Grove), Matthew Briggs (Donnington Grove), Clive Bowler (Oxford City), Craig Buttivant (Gerrards Cross), Kevin Freeman (Stoke Park), Lee Gauthier (East Berkshire), Tom Lawson (Ellesborough), Ben Smith (East Berkshire). Team at Stratford-on-Avon: Craig Buttivant (Gerrards Cross), Adam Clayton (Donnington Valley), Brian Davies (Newbury & Crookham), Guy Dawson (Gerrards Cross), Matthew Haddy (Bicester), Mark Hall (Oxford City), Ben Harwood (Hazlemere), Andrew Mason (Tadmarton Heath), Adam Smith (Buckinghamshire), Adam Wootton (Oxford City). The County played their second League match at Channels GC on Sunday 20th June against Essex. The morning foursomes were shared after David Addison (Donnington Grove) and Ben Smith (East Berkshire) birdied the last to win one up and Tom Lawson (Ellesborough) and Clive Bowler (Oxford City) had a convincing win after a number of birdies. Throughout the afternoon most of the games were very close, we were up in four and Essex were also up in four. This left the match looking like a certain half as the players reached the final holes. Quite quickly, things began to change as the games suddenly swung round. We only managed two ½ points from games we had been three up in and we looked like losing the match as Essex hung on to their leads in the others. Ben Smith, however, played some great golf over the closing holes and earned a ½ point after being 2 down with 5 to play. 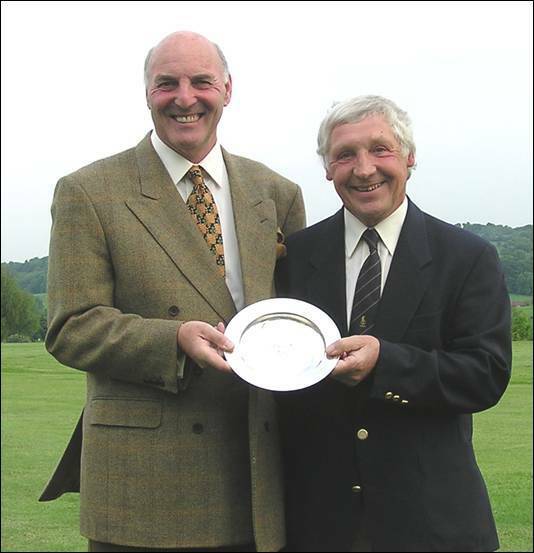 Last game out on the course was Clive Bowler against the home club’s Director of Golf and Essex stalwart – Simon Larner. Bowler was 4 down with 6 to play, but steadily clawed his way back to stand just 1 down on the 18th tee. With Larner some 30 feet away in two Bowler played an immaculate wedge shot to 5 feet which he coolly holed to tie the match. A halved match still keeps us in with a chance of the League title if we beat Hertfordshire and Bedfordshire later in the summer. 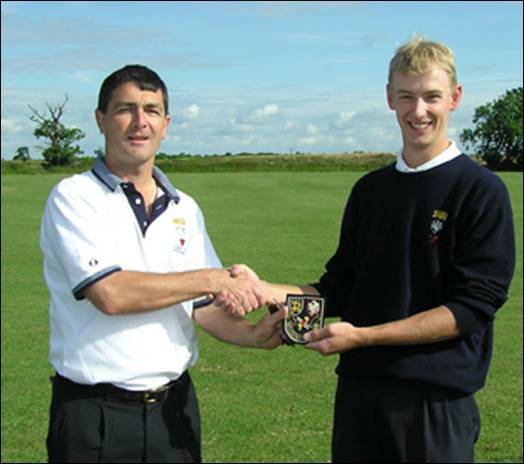 Ashley Walton (Frilford Heath) played his 5th League game and was presented with his County Colours by the Captain Craig Buttivant. 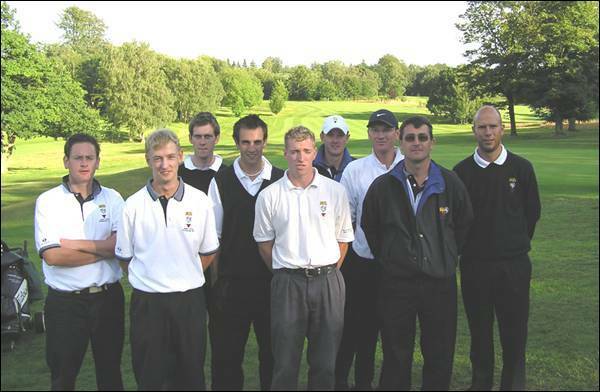 Team at Channels: David Addison (Donnington Grove), Matthew Briggs (Donnington Grove), Clive Bowler (Oxford City), Craig Buttivant (Gerrards Cross), Kevin Freeman (Stoke Park), Tom Lawson (Ellesborough), Ben Smith (East Berkshire), Ashley Walton (Frilford Heath). The County Team played the Club at Woburn on 27th June and suffered an 8-4 loss, despite fielding a strong side. Local knowledge of the Duchess course for the afternoon singles proved decisive and the County side were unable to claw back the morning deficit. 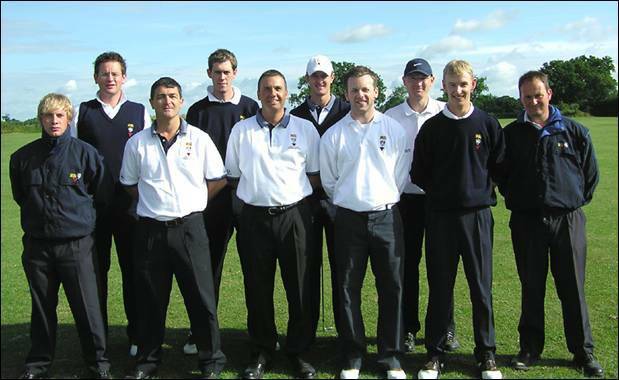 Team at Woburn: David Addison (Donnington Grove), Gregg Blainey (East Berkshire), Jon Carter (Reading), Robert Christian (Beaconsfield), Danny Graham (Hazlemere), Scott Hunt (The Oxfordshire), Andrew Mason (Tadmarton Heath), Ashley Walton (Frilford Heath). Team at Sonning: Jack Bircham (Woburn), Adam Clayton (Sonning), Carl Corbin (Wokefield Park), John Cronly (Frilford Heath), Matthew Haddy (Bicester), Scott Hunt (The Oxfordshire), Daniel Taylor (Woburn), Lee Wanklyn (Sand Martins). The Colts played their first League match against Hertfordshire on 8th May at Huntercombe. On a miserable morning, in the pouring rain, the home team took the morning foursomes 4-0 with some impressive play. The afternoon singles were agreed as halved when it was uncertain if the course would be playable. A disappointment for all, but nonetheless an 8-4 win. Team at Huntercombe: Jack Bircham (Woburn), Robert Christian (Beaconsfield), Carl Corbin (Wokefield Park), John Cronly (Frilford Heath), Matthew Haddy (Bicester), Scott Hunt (The Oxfordshire), Michael Joy (Hazlemere), Andrew Mason (Tadmarton Heath). Team at Sand Martins: Jack Bircham (Woburn), Adam Birdseye (Hazlemere), Robert Christian (Beaconsfield), Carl Corbin (Wokefield Park), John Cronly (Frilford Heath), Matthew Haddy (Bicester), Michael Joy (Hazlemere), Andrew Mason (Tadmarton Heath). The Juniors played Hertfordshire at Porters Park on Sunday 6th June. Trailing after the morning foursomes and further back after 4 of the 12 afternoon singles, a spirited rearguard action saw the team earn a well deserved draw. Team at Porters Park: Daniel Caton (Burnham Beeches), Alex Carey (Sand Martins), Craig Drew (Studley Wood), Lee Frame (Donnington Valley), Robert Hart (Stoke Park), John McNally (Stoke Park), Tim Newton (Reading), Eddie Pepperell (Frilford Heath), Simon Pollington (East Berkshire), Craig Taylor (Woburn), James Weight (Woburn), Dean Wright (Reading). Team at Leighton Buzzard: Kristian Branum-Burns (The Springs), Mark Hall (Oxford City), Robert Hart (Stoke Park), John McNally (Stoke Park), Daniel Taylor (Woburn), Chris Tellett (Woburn), James Weight (Woburn), Gareth Woodward (Witney Lakes), Adam Wootton (Oxford City), Dean Wright (Reading). Team at North Oxford: Bob Clarke (Mentmore), Rod Crisp (Ellesborough), Robert Gill (Gerrards Cross), Ian Hunter (Maidenhead), David Kelly (East Berkshire), David Lane (Goring & Streatley), Anthony Parsons (Denham), David Stevenson (Ellesborough), Jim Walkinshaw (Denham), Alastair Wright (Goring & Streatley). The Seniors played their preliminary round matches at Liphook on 8th July. After a half with Sussex in the morning, the match was decided in favour of Sussex under the 'Nettell' formula. 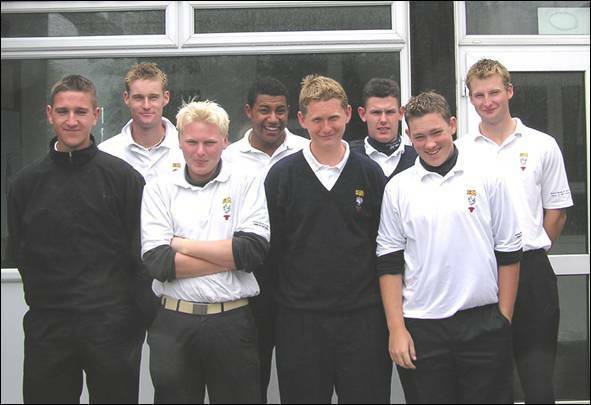 The team went on to beat Hampshire in the play off for 3rd & 4th. We came 3rd out of 4 despite being unbeaten! 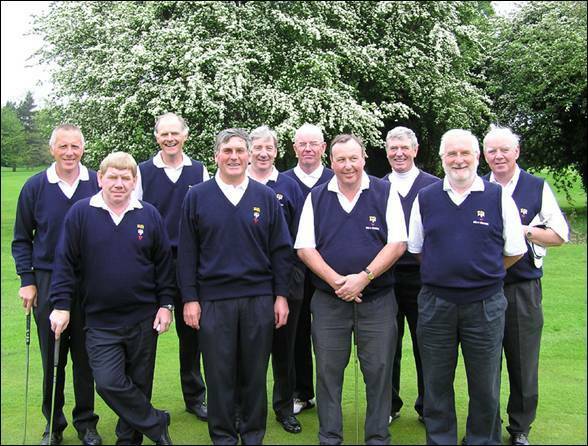 Team at Liphook: Rod Crisp (Ellesborough), Ian Disney (Frilford Heath), Duncan Forbes (Sonning), Robert Gill (Gerrards Cross), Ian Hunter (Maidenhead), David Lane (Goring & Streatley), Roger Mawle (Tadmarton Heath), Anthony Parsons (Denham), David Shaw (Goring & Streatley), David Stevenson (Ellesborough). The Seniors played their second League match at Henley on 15th July. Six of the 10 games went to the last green but with Essex only winning one of them, the home team had a comfortable 9½-3½ win. Our final two matches are both away and we hope we can continue this good form. Team at Henley: Bob Clarke (Mentmore), Rod Crisp (Ellesborough), Ian Disney (Frilford Heath), Duncan Forbes (Sonning), Robert Gill (Gerrards Cross), David Kelly (East Berkshire), David Lane (Goring & Streatley), Roger Mawle (Tadmarton Heath), David Stevenson (Ellesborough), Tommy Wells (Burnham Beeches). 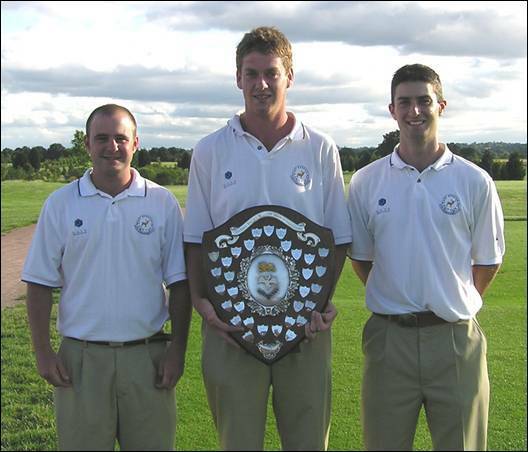 Played at Maidenhead Golf Club on Saturday 15th May 2004. This event also serves as the qualifying round for the BB & O Amateur Championship and is restricted to players between 2.1 and 5.4 handicaps. There were a record 98 entries and players of 4.3 and over were initially balloted out. There were 16 places available for the Amateur which will be played in June at Woburn Golf & Country Club on the Marquess Course. 60 players contested the Trophy on a wonderfully prepared course. The weather was in stark contrast to last year when play had to be abandoned after torrential rain. A fine round of 1 under par 69 from Matthew Rendell (Reading) saw him holding a two shot lead from Luke Thorpe (Chipping Norton) with Michael Forde (Calcot Park), Ben O’Dell (Henley) and Tony Keyes (Magnolia Park) a further shot back. In the afternoon, excellent rounds from Kevin Brant (East Berkshire) and Simon Hunt (Gerrards Cross) saw them join Michael Forde and Ben O’Dell as joint leaders in the clubhouse. Out on the course in the second last group, Matthew Rendell had reached the turn in level par and unaware of his large lead, continued to attack the course and with birdies on two of his last four holes he finished with another 69 to take the Trophy by an amazing 9 shots - a record in the 27 year history of the event. With the handicaps of the field being so close together, the handicap prizes were bound to go to those in the minor placings of the main event. Robert Hart (Stoke Park) was the clear winner with a net 140 followed by Michael Forde and Ben O’Dell. Players qualifying for the Amateur Championship: Matthew Rendell (Reading) Kevin Brant (East Berkshire), Simon Hunt (Gerrards Cross), Michael Forde (Calcot Park), Ben O’Dell (Henley), Robert Hart (Stoke Park), Mark Hall (Oxford City), Tony Keyes (Magnolia Park), Luke Thorpe (Chipping Norton), Steven Doyle (Woburn), James Harper (Castle Royle), Matthew Bransby (Bicester), Kristian Branum-Burns (The Springs), Simon Bulman (Studley Wood), Cliff Pearce (Ellesborough) and David Fulcher (Woburn). 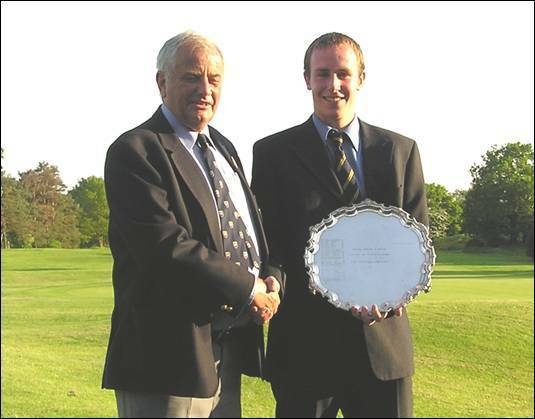 Played at Ellesborough Golf Club on Wednesday 19th & Thursday 20th May 2004. 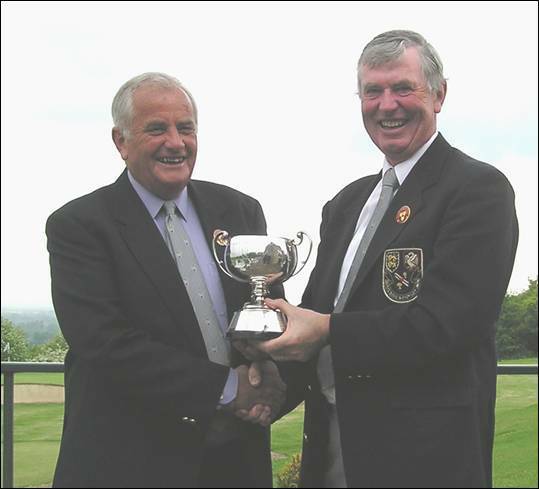 66 players contested this event held at the home Club of the late Reg Pattinson, the first winner of the British Seniors Open back in 1969 at Formby. Play is split over two days and after the Wednesday round there were 6 players within 4 shots of the leaders Robert Gill (Gerrards Cross) and David Lane (Goring & Streatley). Two local players, Peter Bent and Peter Barnett, were handily placed after rounds of 73 and 74 respectively whilst four others were tied after steady rounds of 75. The course was in magnificent condition, with lush rough and fast greens. Local knowledge would prove to be important in round two as some of the pin positions were in quite tricky positions. Roger Mawle (Tadmarton Heath) set the early pace with a total of 152 and was soon joined by Bob Clarke (Mentmore) to share the clubhouse lead. Anthony Parsons (Denham) played another solid round and took the lead on 150 until Peter Bent pipped him by one shot. Out on the course the first round leaders had reached the turn with David Lane opening a four shot lead. His great experience would tell on the back nine when despite two poor holes he was able to hold off Robert Gill’s challenge and he finished in style with a birdie to take his 6th Seniors Title and his third in a row at Ellesborough. How fitting that the Trophy donated in honour of the inaugural British Seniors Champion should go to a fellow Champion (1998 at Western & Glasgow Gailes) and to the President-Elect of the BB&O Union of Golf Clubs. David also took the 60-64 Age Group Trophy, whilst Anthony Parsons successfully defended the ‘youngsters’ Trophy beating Robert Gill on countback. Peter Batchelor (Woburn) took the 65-69 Trophy by 1 shot from Patrick Nolan (Ellesborough) and Ray Bowdery (East Berkshire) was a very respectable 15th in the main event and also took the over 70’s Trophy with two very good rounds of 78. Played at Harewood Downs Golf Club on Friday 28th May. 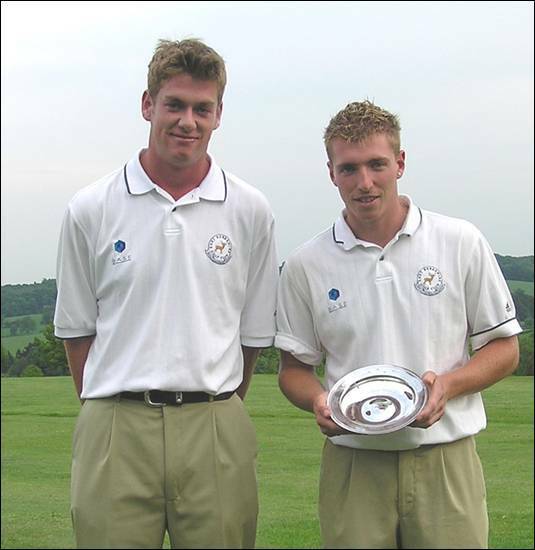 The Scratch Championship was contested by 38 teams and after the morning round there were 3 teams within four shots of the leaders – East Berkshire – represented by Andrew Robson and current County Champion Lee Gauthier. On a breezy day, on a course where local knowledge is important, scoring was not that good and there were numerous scores in the high 70’s. The afternoon round saw an improvement and some excellent golf; with the equal best coming from Paul Middleweek and Lee Wanklyn of Sand Martins who scored 68 with an inward half of 4 under par. Despite good efforts from Julian Sandys & Nick Woodage from Newbury & Crookham, who were level par in the afternoon, the East Berkshire pair continued their fine form and their 1 under par round won them the Title by 5 shots. In the Handicap Championship there were 40 teams taking part and the morning scoring was as difficult for these teams as those in the Scratch event. Just 5 teams were net 70 or better in the morning and a close finish was in prospect as the leaders from Henley – Reece Pigden and Phil Booth were chased down. An excellent afternoon net 67 from Beaconsfield players – Rob Christian and Stephen Farr enabled them to share the lead with Colin Garner and Danny Tucker from Flackwell Heath Artisans. The Woburn team of Colin Bishop and David James, had had a poor 1st nine but an excellent 1 under par gross back nine of 33 proved decisive and their net 70 enabled them to record another triumph for the Woburn Club. Played at Woburn Golf & Country Club around the magnificent Marquess Course on Saturday 12th & Sunday 13th June. With a Par of 72 and an a SSS of 75 for the 7,200 yard layout, this Championship was a real test of stamina for the competitors. 84 players competed on the Saturday for 16 places (and ties) for the final 36 holes on Sunday. In good, but blustery conditions on Saturday morning 3 players were level par with Tom Lawson (Ellesborough) 2 under after an excellent 70 which included 7 birdies. Defending Champion Lee Gauthier (East Berkshire) was amongst those on level and there were another 13 players on 75 or better and it was difficult to predict what the cut would be. The afternoon saw another 13 scores come in at/or under 75 with Gregg Blainey (East Berkshire) and Lawson both with excellent 1 under par 71’s and Lee Gauthier with another 72. This would leave Lawson with a 3 three shot lead from Gauthier and 5 from Kevin Freeman (Stoke Park) and Gregg Blainey. None of the qualifiers from the Penfold Trophy were to make it to the second day as the cut fell at 153 and 16 players went forward for another 36 holes on Sunday. Scores on the Sunday morning were uninspiring as all the players felt tired after the very long day before. Best of these were a 73 from Matthew Pile from the home club with Clive Bowler (Oxford City) scoring a commendable 74 after a damaging 12th hole. Tom Lawson added a 75 to his two round total to take a 5 shot lead into the final 18 holes. Tiredness now played a big part in the proceedings and after 9 holes of the afternoon round just Lawson and Blainey were in contention as the others flagged. Lawson had progressed steadily to the turn at just one over, but Blainey had played brilliantly and reached the turn in 4 under par to reduce the lead to just three shots with Gauthier another two shots adrift. The back nine on the Marquess Course is very tough but after 15 holes Gauthier , fighting back, had got to within 4 of the lead but Blainey had another birdie and was now just two away. Lawson’s policy of ignoring the leader boards paid off as he was unaware of the closeness of the contest and carried on playing his own game. None of the players were able to master the difficult 18th hole, but Lawson’s 5 could not be beaten and he finished winning by 3 shots with Blainey and Gauthier tied for second. 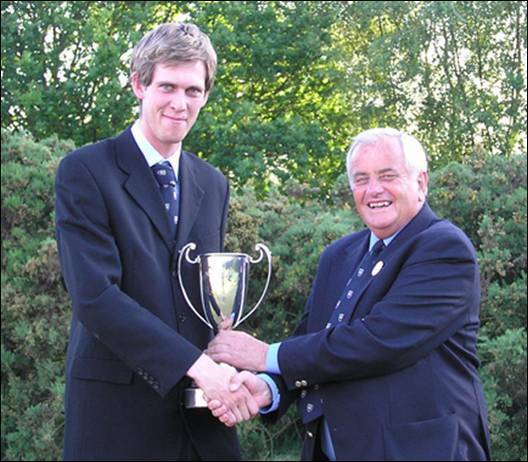 He will now go on to represent BB & O in the County Champions Tournament at Woodhall Spa at the end of September and we wish him well in this Tournament. Played at Bird Hills Golf Club on Saturday 17th July. The event is contested by the top 12 Clubs qualifying through the June Medal round played at their home course. This final format is the best two medal scores from three counting both morning and afternoon. The leading Club goes on to represent BB & O in the English Champion Club Tournament being held at Sandwell Park Golf Club on 3rd & 4th September. The morning finished with just three clubs in the running, Henley and Oxford City were tied at level par but both trailed East Berkshire by 7 shots. The highlights of the morning had been the superb 5 under par round of 67 from Andrew Robson (East Berkshire), Clive Bowler (Oxford City) had a 69 which was just one better than Tom Fleming (Frilford Heath), Lewis Dodd (East Berkshire) and Ben Odell (Henley). The afternoon scores of the leaders improved as the players played conservatively away from a number of tricky pin positions. Frilford Heath set the early pace with a one under par total of 143 to leave them 2 over for the day. Oxford City then produced an excellent 9 under par score with Clive Bowler adding a 67 to his morning 69 and Adam Wootton contributing a fine 4 under par 68. Not to be outdone, the East Berkshire players were all playing wonderful golf and they had the luxury of discarding Gregg Blainey’s 3 under 69 as Andrew Robson carded another 67 and Lewis Dodd finished with a 68. Their score of 135 matched Oxford City to keep their 7 shot morning advantage and take the title. 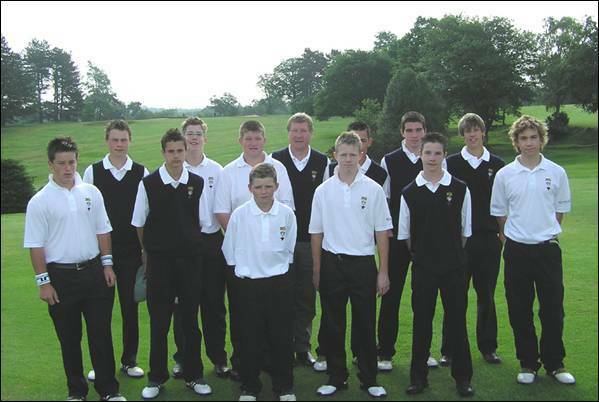 We wish them luck in their attempt to become English Champion Club later in the year at Sandwell Park GC. Played at Moor Park Golf Club on Friday 4th June our Team of 6 players were: Adam Birdseye (Hazlemere), Ben Harwood (Hazlemere), Matthew Rendell (Reading), William Roebuck, Daniel Taylor (Woburn [Captain]), Lee Wanklyn (Sand Martins).The format is 5 scores from 6 count from each round. Competition Scratch Score was 72 both morning and afternoon. Our players were lying equal 5th, 9 shots off the pace, after the morning round with the best score coming from Adam Birdseye (Hazlemere) with a 70. We thought we would improve in the afternoon but we lost ground to the leaders after the 1st nine and were unable to make any headway on the 2nd nine. A very exciting finish saw Essex take the Title by just one shot from Home County Hertfordshire who were also just one shot ahead of defending champions Kent. Our total of 750 left us in 6th position. Played at Wildernesse Club on Saturday 3rd July. Our Team of 6 players were Clive Bowler (Oxford City), Kevin Freeman (Stoke Park), Lee Gauthier (East Berkshire), Tom Lawson (Ellesborough), Luke Rusher (Stoke Park), Stephen Lewton (Woburn). The format is for all 6 scores to count from each round. Competition Scratch Score was 73 in the morning and 72 in the afternoon. Our players were lying 3rd after the morning just 5 shots behind Hampshire and 7 shots behind Surrey. The standard was extremely high this year with 38 players with a ‘plus’ handicap, remarkably the Surrey Team’s combined handicap was Plus 20. Our play in the morning had been a mixture of good and bad and we felt that we would have to make a vast improvement to successfully defend our title. The signs looked promising as a number of the players reached the turn in par or better, but hopes were quickly dashed as the Surrey players started to play to their potential and after 27 holes they had a commanding lead. We were not able to close the gap and Surrey came out worthy winners 21 shots clear of BB & O in second place.